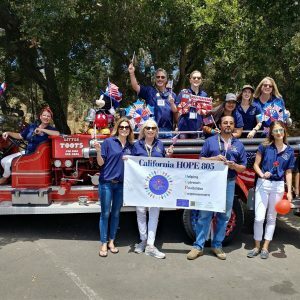 California Hope 805 team at Montecito 4th of July Community Celebration. In the aftermath of the Thomas Fire and 1/9 Debris Flow, residents were confronting many challenges including the physical, mental and emotional impacts of experiencing such a catastrophic series of events. Two collaborative efforts emerged to address the trauma and mental health needs of our communities. In the heart of Montecito, several organizations worked together to open the Montecito Center for Preparedness, Recovery and Rebuilding. The one-stop center became a hub of helpful resources for residents. This included California HOPE 805, a team of trained professionals created to provide emotional support to those who needed it. Funded through the Federal Emergency Management Agency (FEMA), California HOPE 805 addresses the needs of those directly or indirectly affected by the disasters, through a series of outreach efforts, including education, crisis counseling, and resource referrals. At the same time that the Montecito Center was established, the Community Wellness Team came together weekly to create a wide reaching response to the community mental health needs. 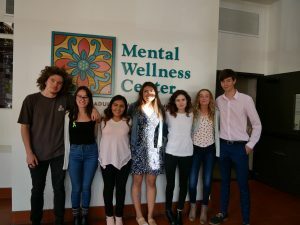 Fourteen organizations participated, including the MWC, Cottage Health, Santa Barbara County Department of Behavioral Wellness, Institute for Collective Trauma and Growth, Santa Barbara Response Network, Hospice of Santa Barbara, Jewish Family Service of Greater Santa Barbara, and the Santa Barbara County Psychological Association. When asked about her key role in post-disaster relief, Cameron instead highlights her gratitude for the community response she has seen. She shares that the most positive outcome has been the notable level of residents’ compassion towards one another. With that, she mentions there has also been a greater understanding that support in mental wellness should be provided at any time, and not only at the point of severe distress. Cameron says the one-year grant from FEMA allowed the MWC to hire 14 full-time staff members to assist in post-disaster relief efforts. That number has dropped to six, which she says is a good thing because it indicates that the need has decreased over time, while residents’ resiliency is increasing. With the program ending on April 26, the California Hope 805 team is making one final push to provide support to affected residents while connecting them with ongoing resources as needed. This will include team members going into the Carpinteria, Montecito, and Mesa areas to distribute 5,000 door hangers as a reminder that help is still available. To address this issue, MWC is once again partnering with other community agencies. Together with Family Service Agency and the YouthWell Coalition, MWC will be offering Youth Mental Health First Aid, a free training course available for the next three years, targeted to parents and teachers. The goal is to educate adults on best practices when interacting with youth who are facing mental health challenges. MWC was a 2017 recipient of a Santa Barbara Foundation Core Support for Basic Needs grant award (now the Behavioral Health grant program). For more information on MWC and its services to Santa Barbara County, visit: mentalwellnesscenter.org.